Livorno is a charming city located on the Western coast of Tuscany, on the Ligurian Sea and is considered one of the most important port of Italy. Don't expect to visit a quaint medieval town like many others in the region, since Livorno is one of the most modern cities in Tuscany, even if there are many archaeological remains that fortunately have not been destroyed during the World War II. Like every port city, Livorno has always been a crossroads and melting pot of the world's cultures and owes its fascinating charm to this multiethnic aspect. Its origins date back maybe to prehistoric times, while many Etruscan and Roman remains have been found all closeby; during the XVIth century, the Medici Family contributed in the development of the city and its sea port, charging the renowed artist Buontalenti with the construction of a new fortified city with fosses and bastions, that gave Livorno those aspect that we can see today. At the end of the XVIth century, Livorno began to house a large Jewish community - of traders principally - that grew more and more till it began one of the most important of Italy; today, you can visit the Synagogue (actually, you need to schedule your appointment to go inside), an impressive religious builiding that stands out from the traditional Italian architecture. One of the most enchanting quarters of the city is La Venezia, a Venezia- style quarter with canals (dating back to the Medici era) crossing the all district, small bridges and boats that reminds one of the city in Northern Italy. It is situated in the historical center near the New Fortress and every Summer - usually on early August - houses one of the most important Summer events of the region, the Effetto Venezia. Music, theatre and cultural performances, food and entertainment for both children and adults give a special touch to the quarter that come alive until late night for a few days. If you visit Livorno with kids, one of the attractions you should see is the Aquarium, with colorful fishes, turtles and many others: a funny break from the city seightseeings that your kids will surely appreciate. But one of most suggestive places is the Terrazza Mascagni, a great chessboard-style terrace made of many white and black tiles located along Viale Italia, separated from the sea by an elegant parapet with columns. The ideal venue for a romantic evening! If you head to this Tuscan port city, you must try out its great seafood, there are many restaurants both in the historical center and along the lungomare that stretches south to the city, where rocks make space for a bit of beaches. Especially there, you'll find many nice and delicious places to eat at, which are informal and familiar and, above all, have reasonable prices. From Livorno, thre are many ferries leaving to Corsica and Sardinia, as well as Capraia and Gorgona, part of the Tuscan Archipelago, and the city is easily reachable from any other Tuscan locations both by car and train, so it's the perfect destination for a day trip during your holiday in Tuscany. Many times overlooked, the city of Livorno, with its down to earth ways, risqué sense of humor, great fish dishes and unusual scenery, will be just the right distraction while on holiday. Visit the Aquarium in Livorno and get a wonderful experience together with green turtles, sharks, jellyfish and many others. 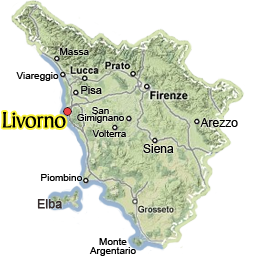 Do you have a day or a weekend to spend in Livorno? Here are our recommendations for how to get there, where to stay, what to see and to do, and where to eat at. Brilliant colors, sandy beaches, the enticing perfume of freshly cooked fish...this and more are the trademarks of Viareggio, the ideal seaside resort city along the Tuscan coast. Easy to access with car or public transport, make this a special stop on your holidays. "Effetto Venezia" is the most beautiful summer festival in Livorno, taking place every year at the end of July and the first days of August. On this occasion, the characteristic neighborhood called "La Venezia", or Venice, comes alive until late into the night as it hosts music, theater and entertainment for all ages. An event not to be missed! Visit that part of the Tuscan coastline going from Livorno to Piombino, known as the Etruscan Coast for the rich presence of Etruscan archaeological sites, where you'll find also natural unspoilt protected areas, long sandy beaches and quaint villages.